Can You Feed a Dog Ice Cream Cones? Can something as innocuous as ice cream be a danger to dogs? 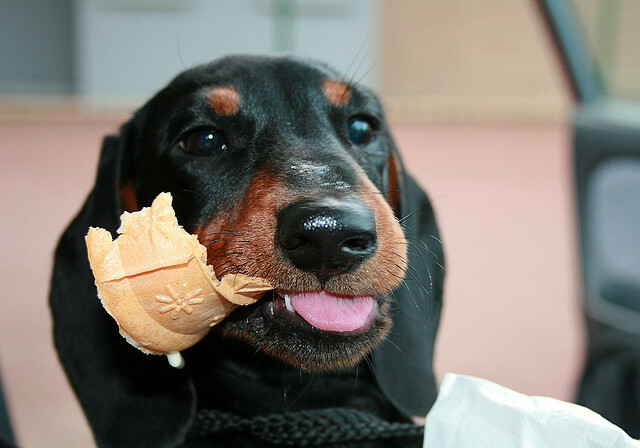 Read on to find out why feeding a dog ice cream cones and other dairy can carry health risks. I have a friend in Portland, Oregon, who owns an 80-pound Standard Poodle/Bernese Mountain Dog named Phoebe. She’s a big, playful dog, galumphing toward you as soon as she sees you — and almost always knocking you back on your heels, if not on your behind, every time. Her healthy black coat looks and feels more like human hair than animal fur. Her eyes get really big when you focus all your attention on her. She has beautiful posture and big fluffy paws, which are terribly noticeable when she sits on her hind legs and pedals them at you. Her best attribute, however, is her boundless energy, much like a happy child’s exuberant temperament. Also like a kid, Phoebe loves her ice cream cones. She’s allowed to gobble down one per year — on her birthday. I think it’s the dearest, sweetest thing to feed a boisterous dog like Phoebe a big, tasty treat for which we all generally hanker. But it also makes me wonder how safe it is to feed dogs a food that was made for the pleasure and consumption of humans. Dairy and Dogs: Does the Combination Always Spell Disaster? At Petful, we give a lot of advice on what not to feed your pets, as the list is long and not always easy to navigate. Several human foods can be detrimental to a dog’s health, and feeding a dog ice cream cones, especially often, can carry some health risks. The amount of dairy that’s healthy for dogs really depends on the particular pooch. Some dogs carry the enzyme lactase to metabolize lactose found in milk and other dairy; others don’t, which can lead to symptoms of lactose intolerance in dogs, include bloating, loose stools and general discomfort. If you feed your dog dairy and notice these symptoms, it’s a good sign that your dog is lactose intolerant, a condition which can either be genetically inherited or developed over time. If your dog doesn’t seem to have any problems digesting ice cream, you’ll still want to limit the amount you give them because of ice cream’s high sugar content — this also applies to the cone that holds the ice cream, which is very high in sugar. There are also several other dairy options that some dogs can handle with low-sugar, high-protein ratios, such as cheddar cheese and yogurt. But again, it’s a good idea to serve small, infrequent portions of these foods to your pet to avoid building lactose intolerance. If you do feed your dog ice cream cones, make sure that the ice cream and cone are made from natural ingredients to avoid ingestion of xylitol, a sugar substitute that is toxic to dogs. Also, give your pet a simple, dog-friendly flavor of ice cream, such as vanilla. Chocolate, as we all know, carries significant health risks for dogs. Spring is quickly giving way to summer (at least in New York) and the ice cream trucks are already making the neighborhood rounds in full force after dinner time. Their recognizable tunes can be heard several blocks away. Kids squeal in delight and parents shell out for ice cream cones, popsicles and other icy delights. If you have found that your pup is lactose intolerant, that doesn’t mean he can’t join in on the summertime fun. There are several name-brand frozen treats out there, but if you want to know what goes into your dog’s food (while cutting down the fat and sugar), it’s simple and easy to make your own iced dog treats. 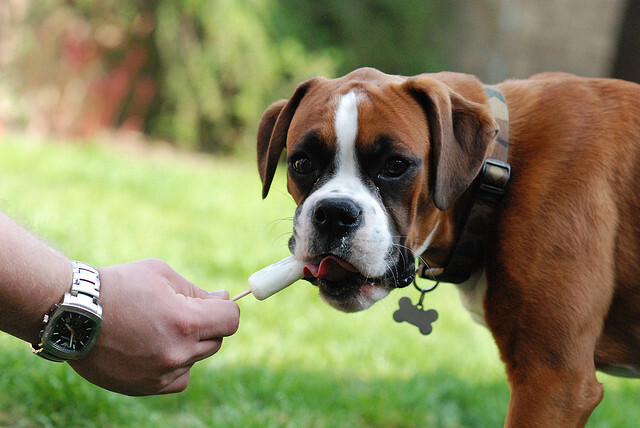 The Humane Society offers a fabulous non-dairy recipe for Pupsicles, which are perfect for your dog on hot days and warm nights. Other icy delectables from Dog Treat Kitchen include savory frozen treats (including tuna pops!) that your pooch will be sure to value highly during the summertime. I still love the idea of Phoebe and her once-a-year ice cream cone — and I can’t say I don’t mind the distraction from Phoebe licking my toes to death. Phoebe has never had an averse reaction to these rare treats and enthusiastically feasts on a healthy diet the rest of the year. She and other contented dogs are lucky to have owners that look out for their pet’s health and happiness.